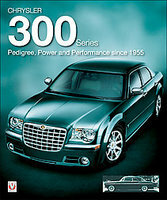 Chrysler 300 car books cover the history of this Chrysler model plus workshop manuals. The Chrysler 300 'letter series' were high-performance luxury cars built in very limited numbers between 1955 and 1965. The Chrysler 300 'non-letter series' was a full-size automobile produced by Chrysler from 1962 until 1971. 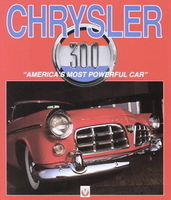 Chrysler 300: America's Most Powerful Car by Robert Ackerson (2004). 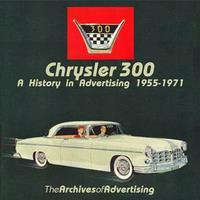 From C-300 to 300L is the full story of Chrysler's famous 300 Letter series, which were produced between 1955 and 1965. In 1951 Chrysler produced its first ever V8 engine - the 'Hemi Head', which produced much more power in relation to its capacity than any of its competitors could manage. In 1955 the new 300 horsepower Chrysler C-300 was launched as America's Most Powerful Car. Chrysler 300 1955-1970 by R M Clarke (1974). 300, B, C, D, E, F, G, H, I, J, K, L, Hurst, De Soto Adventurer, 300-440cc, history, new model reports, comparisons, road tests, styling and specifications. Chrysler 300: A History In Advertising 1955-70 by William McBride CD ROM (2001) covers both the letter cars and the non-letter cars through 1970. This CD-ROM contains a browsable collection of ads carefully scanned from original magazines and newspapers. The ads are searchable by year and model of product and can be viewed on any computer.